This National Historic Landmark was the home of William Lloyd Garrison (1805-1879), one of the most articulate and influential advocates of the abolitionist movement in the United States, from 1864 until his death. Through public lectures and editorials in the Liberator, the newspaper which he founded in 1830, Garrison argued unequivocally for immediate emancipation of slaves. Born in Newburyport, Massachusetts, Garrison gained experience in publishing while an apprentice and in 1826 purchased a local paper which he named The Free Press. After this newspaper failed, he moved to Boston and became joint editor of the National Philanthropist, a newspaper devoted to the temperance movement. During this period, Garrison met Benjamin Lundy, who was already active in the temperance movement, and decided to start speaking publicly against slavery. On July 4, 1829, Garrison delivered the first of many public addresses against the evils of slavery. In the fall of 1830, Garrison founded the Liberator. Although the paper seldom met its expenses and never had more than 3,000 subscribers, it aroused the Nation as few newspapers had in the past. The Liberator was published until the ratification of the 13th Amendment with the final issue being printed on December 29, 1865. Besides publishing his newspaper, Garrison also organized the New England Anti-Slavery Society in 1832 and helped to establish the American Anti-Slavery Society in Philadelphia a year later. After the Civil War, Garrison went into semi-retirement but continued his campaigns for prohibition, women's rights, and justice for Native Americans. 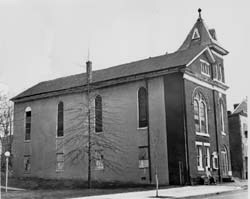 After Garrison's death, his house was owned for a time by the Rockledge Association, an organization of African Americans formed to preserve the building. 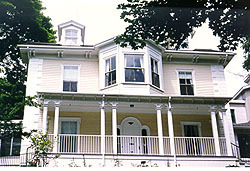 In 1904, the house was acquired by the Episcopal Sisters of the Society of St. Margaret who own the property today. Though not directly associated with the Underground Railroad, the William Lloyd Garrison House stands as a monument to the man who established the moral nature of the conflict that led to the Civil War. The William Lloyd Garrison House is located at 125 Highland Street in the Roxbury section of Boston, Massachusetts. Privately owned, it is not open to the public.